Today’s 2010 Knight-Batten Symposium gave me visions of political debates and speeches transformed from exercises in sound-bitery and emotion into civic lessons and conversations. It gave me visions of political news stories that provide context not just about the issue at hand, but also context about the people at hand. 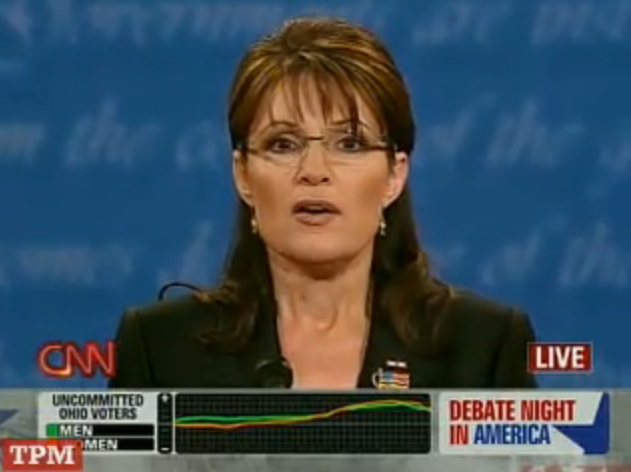 On TV, political debates display a fact-check tally for each candidate (how many true, truthy, lying-liar, etc. statements each candidate has made). Fact-check details about a particular statement are displayed as soon as they’re available. Campaign contributions to that person from individuals/organizations related to the story’s subject. The candidate’s biggest contributors (individuals/organizations and industries). If in office, recent votes the person has taken related to the story’s subject. Biographical information about the person. Now here’s the great thing about these visions: The Sunlight Foundation and PolitiFact have pretty much already fulfilled them! Sunlight’s executive director, Ellen Miller, announced in her acceptance speech that Sunlight Live will be open-sourced — so any and every news site should try to use it for national, state, and/or local political coverage. It seems that an open-source Sunlight Live could also be used by the networks for their TV coverage, but if not they should be able to come up with their own stripped-down versions. Meanwhile, PolitiFact won a Knight-Batten Special Distinction award for its Obameter, which tracks how well President Obama has lived up to his campaign promises. The Obameter and PolitiFact’s bread-and-butter Truth-O-Meter fact-checking model (which won a previous Knight-Batten award, not to mention a Pulitzer Prize) should become the standard for routine political coverage across the country. Indeed, newspapers in eight states have licensed PolitiFact for their own coverage. Combining Sunlight Live with the PolitiFact approach would make live coverage of speeches, debates, and hearings infinitely more useful. Much of what’s said in these events has already been said elsewhere, so previous fact-check items could be pumped in in real time. New statements that can be preliminarily fact-checked in near-real-time could be displayed on-screen as soon as they’re checked. And a tally of the veracity of any speaker’s statements to that point would help viewers judge the debate on more than style points. One of the TV networks should take a chance and try this out. ABC News already has PolitiFact fact-checking This Week, so maybe they’d be up for it. Now consider how the Sunlight Foundation’s and PolitiFact’s tools and/or approaches could improve online political coverage. Sunlight offers a cool tool called Poligraft that parses a text story and automatically generates information on contributions and lobbying for the politicians and political groups mentioned. Poligraft has an API, so it seems that any news organization could use the tool to parse its own stories and add the Poligraft-generated information to a story’s page. 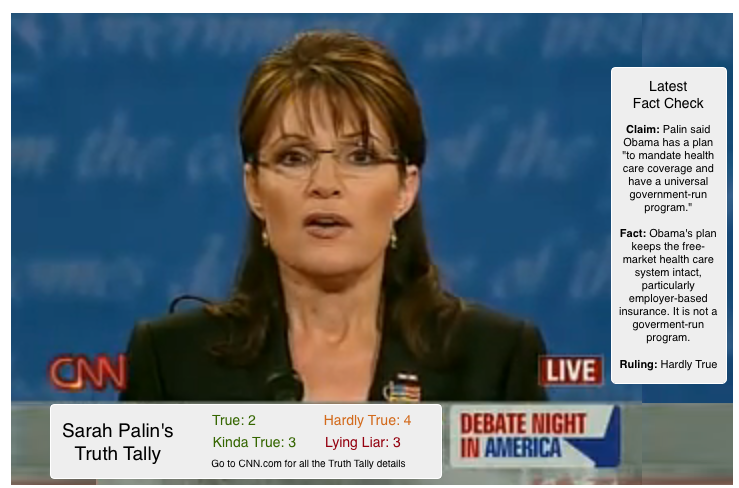 PolitiFact also offers embeddable widgets, which display Truth-O-Meter or Obameter rulings and link back to the full PolitiFact item. As PolitiFact’s national operation covers more and more politicians’ statements, and as the state PolitiFacts add state and local politicians to the growing fact-checking database, the widgets could become even more useful. At some point, there should be enough location- and person-specific items for PolitiFact to offer more granular widgets, for example a Truth-O-Meter widget for only Georgia’s governor or for only Florida’s senators. All of these tools are great ways to add a particular kind of context to political stories. We often talk about context in terms of policy — for example, providing readers with more explainers about the health care system. This is very important and worthwhile, but it’s also important to provide context and details about the politicians who shape these policies. Every news organization should think about incorporating the Sunlight Foundation and PolitiFact widgets and data into their political coverage. Every TV network should think about incorporating the organizations’ tools and approach into their coverage of live political events. And the potential for better political coverage all around should give journalists and civic-minded people everywhere the vapors. Disclosures and notes: My employer, Publish2, received a 2010 Knight-Batten Special Distinction award. I used to work at the St. Petersburg Times, which created and runs PolitiFact, and I wrote two PF items while I was there. In the CNN mockup: the background has been manipulated for mockup purposes; the fact check text is lifted from this PF item; and I chose names for truthiness levels that are an homage to but slightly different from PF’s to show that this can be done without licensing PF (though I think it would be great if all news organizations licensed PF). This entry was posted in Journalism, Newspapers, Politics, Technology and tagged data, fact-checking, PolitiFact, Sunlight Foundation, transparency. Bookmark the permalink.